Born and raised in New York City, lyricist Fred Ebb comprised half of one of Broadway's most enduring songwriting teams - the other half being composer John Kander. Although an interest in theater developed much earlier in his life, it wasn't until he reached his twenties that Ebb turned it into a career, having already earned a Masters in English Literature from Columbia University and worked his way through odd jobs ranging from the hosiery racket to bronzing baby shoes. His earliest writing efforts were made for various nightclub acts and theater revues, as well as contributing to the TV news satire That Was The Week That Was. One of the revues to which he supplied lyrics, From A to Z, managed a brief run on Broadway in 1960; prior to meeting Kander, however, his success in musicals proved less than astonishing (Morning Sun, for example, lasting only eight performances before closing down). Ebb's fortunes turned around shortly after being introduced to Kander by music publisher Tommy Valando in 1962; within than a year the two had already scored a hit when one of their first collaborative songs, My Coloring Book, was recorded by Barbra Streisand. Kander and Ebb then followed up with Golden Gate, a musical that never fully materialized but led directly to a commission from Harold Prince to write Flora, The Red Menace (1965). Although Flora wasn't particularly well-received, it helped to further establish the team's reputation and provided their first opportunity to work with then 19-year-old vocalist Liza Minnelli, who made her Broadway debut in the production. With their next commission from Prince, the songwriting pair secured their place in musical theater history: inspired by Christopher Isherwood's Berlin Story, Cabaret (1966) was an enormous success with both critics and audiences, and went on to earn both the Tony award for best musical and a Grammy for its original cast recording. A 1972 film adaptation of the show later followed suit by winning 8 Oscars, including best actress (for Minnelli) and best director (for Bob Fosse). After Cabaret Kander and Ebb composed several more musicals (Zorba (1968), The Happy Time (1968), 70 Girls 70 (1971)) before once again producing a major work in the form of Chicago (1975). Unlike Cabaret, Chicago, although reasonably popular during its first run, gained its status only much later through a 1996 revival production and 2003 film adaptation, both of which received numerous industry awards. Perhaps the most well-known single composition by the pair surfaced two years later as the title song to the Martin Scorsese-directed film musical New York, New York (1977) - now best remembered for the version rendered by mob-run crooner Frank Sinatra. Although Kander and Ebb maintained a fairly steady output up into the 00s, none of their subsequent works - with the exception perhaps of 1992's Kiss of the Spider Woman - has yet achieved the standing of Cabaret or Chicago. Outside of his work with Kander, Ebb was also involved in a number of television programs, working as producer for the Shirley MacLaine/Lucille Ball-led musical comedy Gypsy in my Soul (1976), as lyricist for Baryshnikov on Broadway (1980), and as both for Liza with a 'Z' (1972) and Goldie and Liza Together (1980). 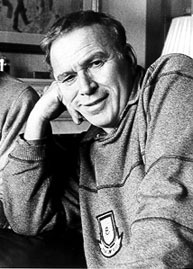 His long-standing partnership with Kander was maintained until the end of his life, with several projects still in preparation at the time of his death in 2004.